A person should strive to use every talent and skill they have, not only for their own benefit, but for the benefit of the whole world. Understand that society is the source of whatever pleasure one derives and whatever wealth one achieves in life. We owe everything to society and should be grateful to society for all that we receive from it. We have to repay this debt by helping at least as many people as we can. With a genuine keenness or readiness to serve others, one can attain happiness in any group or community, and the very eagerness to serve others will endow you with the power and skill necessary for the required service.Nowadays, we tend to regard it as derogatory to serve, but there is great worth in service. People have become so selfish that they no longer care for others, or anything other than their own welfare. When one constantly thinks only of one's own body, one's own family and one's own comfort, one is a truly selfish person. The only way to cleanse such hard-heartedness is through service to humanity. The cure that Baba has given us for this malady, is service. Service slowly and steadily broadens one's heart, bringing with it an unexpected feeling of happiness, and it begins to transform the community around us as well. The service activity which one may, at first, have started with a certain reluctance, soon becomes a labour of love: one's heart has broadened to include others; and the more people one loves, the happier one becomes. this is a spiritual truth that we need to re-discover. Our service will have benefited others, but it will have benefited us also. ?If you lift the hand to serve, to help, to console, to encourage another man you are lifting it for God, because in every man is God. Be of service to others, for that is giving yourself to Me. For whatever you give, I will repay you thrice, Nay I shall repay you ten-fold. Try Me and you will see. I say to those who know the joy of giving, look back! Yes, look back and see how each time you felt that nothing but a miracle could save you, keep you alive, fill your larder, save your son, stop a disaster - has not that miracle happened? Divine guidance is always at the side of the giver. Yes, I will give to those who give of themselves, untold Joy and Bliss; and what is more, I will lead them by the hand along those petal strewn paths of Eternal Joy. six of sleep and six for service to others. Service broadens your vision widens your awareness. Deepens your compassion. Service is divine - It makes life worthwhile. Service is greater than meditation. Through Seva Sadhana, Hanuman attained identity with Rama, as the river attains identity with the sea. Arjuna too considered every act as Sadhana to attain the grace of Krishna, for Krishna directed him to fight on, ever keeping Him in memory - "Maamanusmara Yuddhyacha". You too should keep God ever in your mind as the pacesetter, whether you are serving patients in the hospitals or cleaning a drain in the bazaar. That is the tapas, that is the highest form of Sadhana. 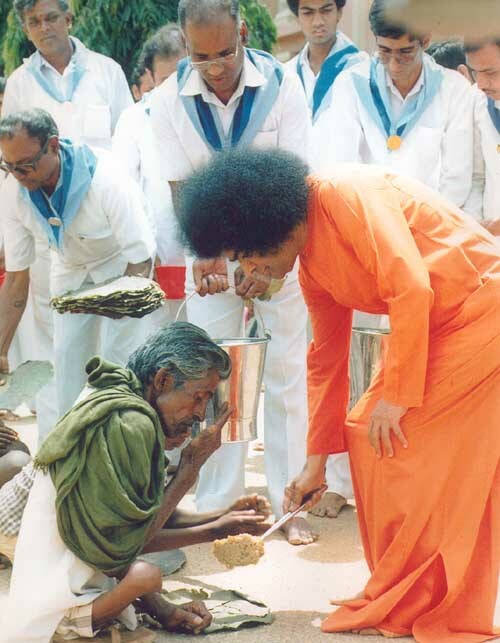 More than listening to a hundred lectures or delivering them to others, offering one act for genuine Seva attracts the Grace of God.